When you hear the word immunotherapy what comes to mind? An obscure therapy of some sort that has not yet been very well explained? In this article, you will find out about the immune system, how it works and how these new immunotherapies are helping our own bodies attack and kill cancer wherever it might be. The immune system is a combination of organs and specialized cells that works to tackle infections and other conditions, such as allergens or disease-causing organisms. The immune system is composed of the lymphoid organs and a series of lymph vessels that connect them. These organs are the lymph nodes (spread all over the body), the Thymus gland (located in the middle of the chest, behind the breast bone), bone marrow (located mainly inside long bones, breast bone and hips), spleen, tonsils, adenoids, skin and liver. Each of these organs has a different function in a process called the immune response. The bone marrow houses “mother” or stem cells that will transform or mature into the many immune system white cells that travel throughout the lymph system and the blood stream. These cells can be myeloid, and turn into leucocytes and macrophages, or lymphoid and mature into lymphocytes B, T and natural killer cells. The Thymus gland houses lymphocytes, transforms them into T-cells, and produces hormones that tell those T-cells to travel to the diseased site and attack viruses, bacteria, microorganisms or diseased cells. T-cells also travel to the lymph nodes and the spleen, where they wait for the immune response to activate. When the lymphocytes mature into T-cells, they are ready to tackle the disease. T-cells specialize in destroying damaged and infected cells as well as in telling B-cells to produce antibodies (also called immunoglobulins), which are proteins that attach themselves to the foreign object (virus, bacteria, damaged cell or microorganism), and leave it ready for destruction. B-cells mature into plasma cells that make antibodies. They can remember past infections, and ready the body in case it comes in contact with such organisms. The tonsils and adenoids have a similar function as the lymph nodes; they house white blood cells waiting to take part in the immune response. The skin is the first line of defense against disease-causing organisms, and the liver, among many other functions, can also be involved in the immune response. When it comes to cancer, the immune system might or might not respond on its own, since cancerous cells have the capability to turn the immune response off. They are also not perceived as foreign by the immune system, which is why they manage to grow out of control. In addition, the cancer treatment itself depletes the immune system by making the bone marrow sick, which interferes with the production of blood cells, including immune system cells. 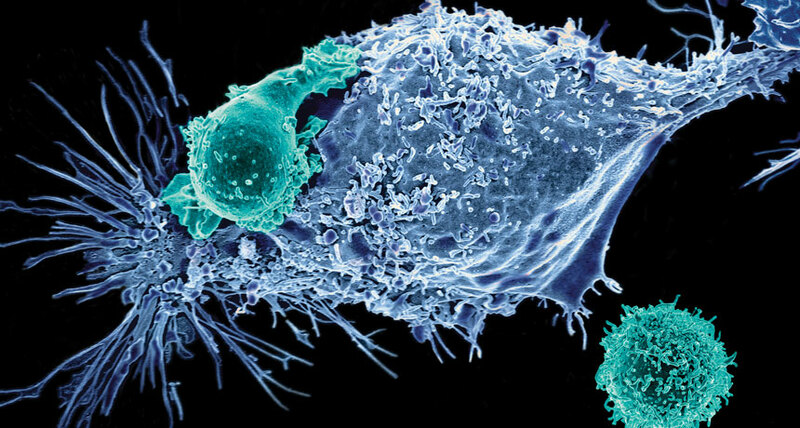 Immunotherapy boosts the immune system and directs the immune response to attack cancer and treat it as a foreign organism. There are different types of immunotherapy being studied, from monoclonal antibodies (also called targeted therapy) to cancer vaccines. In this article we will learn about the latest of these therapies, which is called CAR T-cell therapy. In a recent webinar hosted by the Canadian Cancer Survivor Network, Dr. Jim Whitlock of the Hospital for Sick Children in Toronto gave a very detailed explanation of how these therapies work. CAR T-cell stands for Chimeric Antigen Receptor T-cell, and consists of a T-cell that is modified in a laboratory to carry a monoclonal antibody receptor that works specifically against a protein called CD19, which is present in most cancers, such as Acute Lymphocytic Leukemia (ALL), Lymphomas, and solid tumours. To administer this treatment, blood is taken from the patient and through a process called leukophoresis; T-cells are harvested and sent to the lab. Then a series of chemotherapy treatments wipes out the leukemia cells, and the new engineered CAR T-cells are put back into the blood stream (like a regular blood transfusion) to kill any new cancer cells that may appear. The engineering process involves the creation of monoclonal antibodies that will attach themselves to the cancer cells. The way these monoclonal antibodies are injected into the T-cells is by modifying a viral DNA to produce antibodies specific for the protein CD19. When tumour cells grow and express this protein, the immune system recognizes it as a foreign organism and unleashes an attack to kill the cancer cells. This is the genetic engineering that makes CAR T-cells different from naturally occurring T-cells. This treatment to the CAR T-cells ensures that only cells expressing CD19 will be attacked and all other cells will be left intact, reducing some of the unwanted side effects that other therapies present. However, this process has its own consequences in that there is the risk of overproduction of cytokines, a type of protein that causes flu-like symptoms or sepsis-like syndrome that goes from mild to severe and can be deadly. Patients need to be in the Intensive Care Unit (ICU) in anticipation of these serious symptoms. According to Dr. Whitlock, virtually all cancer cells express the CD19 protein; however, it is easier to tackle it in leukemias and lymphomas that involve cells travelling through the blood. The results of trials are very promising; 90% of patients with acute lymphocytic leukemia (ALL) and 80% of patients with large B-cell non-Hodgkin lymphoma showed remission and were cancer free the first six months after treatment. The efficacy of CAR T-cell immunotherapy has been proven in patients that have received previous treatments in the form of stem-cell transplants. However, in some cases, the cytokines produce a strong immune reaction that places the life of the patients at risk. Current clinical studies are trying to gain more control over the immune response to modify the severity of response. Worldwide studies are also taking place to apply this technology to solid tumours as well. 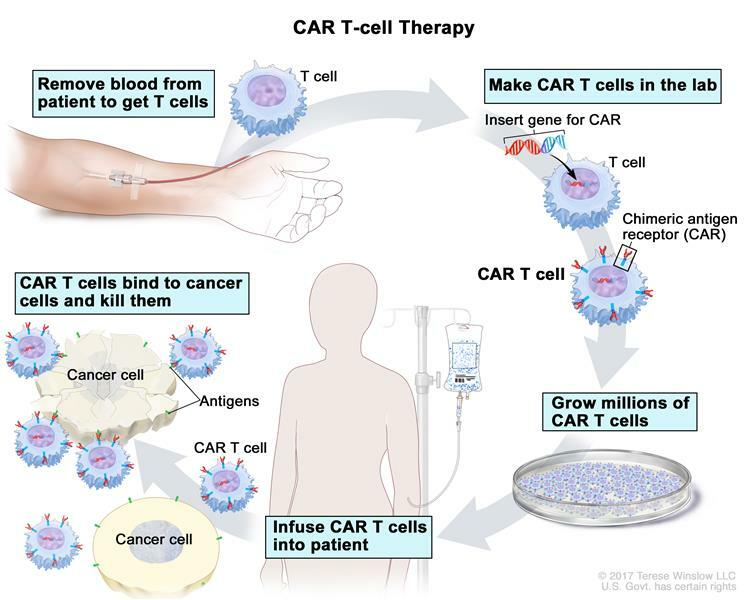 The promise of CAR T-cell therapy as well as that of other immunotherapies is great, and further studies and clinical trials will make it even more.